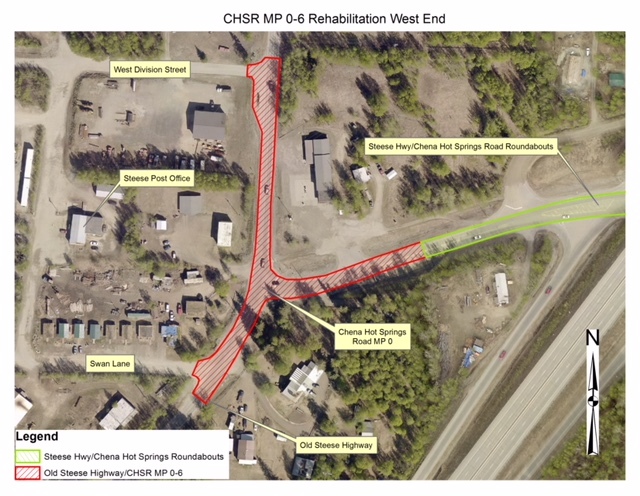 The DOT&PF seeks to improve safety and mobility and to reduce annual pavement maintenance costs through the proposed construction of two roundabouts at the intersection of the Steese Highway and Chena Hot Springs Road (CHSR) and by rehabilitating milepost (MP) 0-6 of CHSR from the Old Steese Highway to Nordale Road in Fairbanks. After careful consideration of comments received through public involvement, examining the results of telephone surveys, and incorporating feedback into the project design, DOT&PF is moving forward with the construction of the Steese/CHSR roundabouts and a new project that will include roadway surface rehabilitation on CHSR from MP 0-6 (Old Steese to Nordale). Construction is expected to begin in 2020. The CHSR MP 0-6 road corridor is characterized by frost heaves that are so significant, they are beyond the ability of routine maintenance operations to reasonably address. In addition, data indicates the risk of being in a crash at the intersection of the Steese Highway and CHSR is greater than other similar intersections in the state. This is likely due to high speeds through the intersection and lack of sufficient sight distance. National studies show that intersections converted to roundabouts reduce fatalities by an average of 90% and reduce crashes that cause injury by an average of 76%. Local roundabout conversions support the national statistics. In the 10 years since roundabouts were built in North Pole, there have been zero injury crashes and a 68% reduction in overall crashes. 8,000 vehicles travel through the intersection at the Steese Highway and CHSR every day. 4,000 more vehicles travel on CHSR through Nordale Road. That volume is expected to grow with the development of North Pole and Northeast Fairbanks, which will increase congestion. Roundabouts offer the least amount of delay compared to stop-controlled intersections and traffic signals. The east roundabout will be have a bypass lane for northbound Steese Highway traffic to turn eastbound on CHSR, completely bypassing the roundabouts. Rehabilitating the roadway will allow for more comprehensive repairs to the frost heaves, making for a smoother driving surface from Nordale Road to the Steese Highway. In addition, the Old Steese Highway intersection will be paved from W. Division St to Swan Lane, including a short section of improvement where Swan Lane (US Post Office access road) intersects the Old Steese Highway. Proposed Elementary Drive intersection improvements. The environmental review, consultation, and other actions required by applicable Federal environmental laws for this project are being, or have been, carried out by DOT&PF pursuant to the 23 U.S.C. 327 and a Memorandum of Understanding dated November 2, 2017 and executed by FHWA and DOT&PF.